Amid an ever-changing investment landscape, investors need a knowledgeable and experienced partner who can guide them through the intricacies of investing and financial planning. The need for competent, objective financial guidance has never been greater. Our clients sometimes experience complex financial circumstances that are not successfully addressed with ordinary packages and products. We follow calculated steps to identify the right strategies. Our focus is on performance, service, transparency, and appropriateness. Connect Your Money to Your Life™. Our first step is to assist you in determining what you want your money to do for you and clarifying what you want your future to look like. The next step is to determine what other aspects of your financial life could affect how your portfolio is constructed. We do this by ensuring your investment selections are consistent with your asset protection concerns, your estate plan, your growth/preservation expectations, your income and estate tax considerations, and your legacy and charitable desires. We create a portfolio structure designed to move you toward your goals. We consider all available asset classes and multiple investment styles, as well as your investments and other assets held outside of the portfolio, to build a portfolio to address your needs. Our investment selection is a rigorous process involving screening potential investment options for suitability, risk/return, manager tenure and consistency, liability, expense, income and tax exposure. We then analyze the results relative to the potential return to determine whether the investment makes economic sense. Our selection process considers investments that have passed the rigorous due diligence and screening procedures and investigations of the Research Department of LPL Financial. We consider the recommendations of the LPL Research Department as part of our due diligence process, along with a myriad of other resources, including face-to-face meetings with the companies with which we are considering placing investments. An experienced, proven, and objective partner, LPL Financial has no proprietary products, investment banking business, or any other conflicts that get in the way of providing independent, objective recommendations - just one way LPL Financial differs from Wall Street firms. LPL Financial delivers in-depth research and timely perspectives about the ever-changing global economic marketplace. 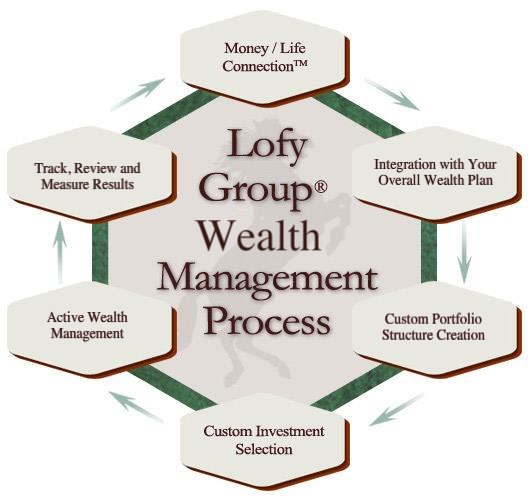 Lofy Group has direct access to LPL Financial's team of analysts and to superior tools and technology designed to effectively and efficiently increase the value and impact of LPL Financial's independent research. Some of the things that set LPL Financial at the top the financial services industry are its access to best-in-class investment vehicles, and managers and their management teams, the breadth and depth of the Research Department's team experience, their focus on investment performance behavior in different market environments, and their in-depth analysis of manager performance cycles. Your account is actively managed and reviewed continually. The extent of your participation is up to you. We communicate with you regularly and are available any time to discuss your portfolio design and individual investments. We monitor and track your portfolio’s progress against the results of your Money/Life Process, and against your personal and industry performance benchmarks. We meet periodically with you to review your portfolio progress, and at least annually to review your entire Wealth Plan.